Above the skies of the Oblivia Region, a group of criminals known as the Pokemon Nappers are chasing a Latios. Suddenly, a young Pokemon Ranger named Natsuya appears on a Mukuhawk and tries to stop them! The Nappers seem to be in a real pinch until their leader, a man known simply as Red Eye, launches a surprise attack and knocks Natsuya out of the sky! The young boy washes up on the shore of Dorop Island where he spots a Pichu with a ukulele. Natsuya captures it and takes it along with him to Reinbow Island in order to continue his pursuit of the villainous team. Natsuya eventually arrives at the Yasuri Cave, where he witnesses the Nappers stealing a stone plate with a strange sign engraved on it. Just as the Pokemon Nappers begin to make their escape, the sky becomes dark and lightning begins to reign down on the earth. Suddenly, the legendary pokemon Raikou appears! The short was aired in two four-minute installments on the variety program Pokemon Sunday. It aired during Pokemon Sunday episodes 280 (February 28th, 2010) and 281 (March 7th, 2010). The short's story is basically an abridged version of the beginning parts of the game. 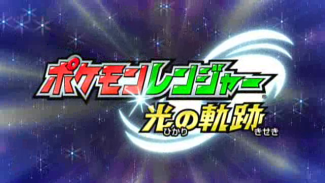 After the second half of the short concluded, the hosts of Pokemon Sunday tell the audience that they will have to play the game Pokemon Ranger and the Tracks of Light in order to get the rest of the story. Both parts of the special were streamed on TV-Tokyo's site until March 21st, 2010.